Wow, put to death, man I am so glad we are not bound by the law anymore. 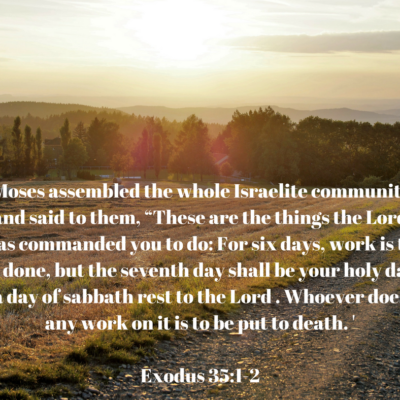 Can you imagine how many of us would be put to death for working on the sabbath? We’d have so many people that would be put to death for working non-stop. We would have some people who may even like that consequence because they work so much it feels like death would be a better out. We live in a world where hard work is a badge of honor, and any type of rest is seen as weakness. This in our society would be horrific. We want to work, we want to work more, to get more done, to keep going non-stop. We weren’t created for that. Most of you realize if you have been burning the candle at both ends, we are not created to be that busy. 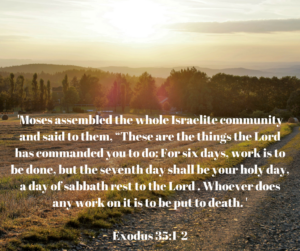 We were created to work and to rest. And not only that, we were created to enjoy that rest, to not feel sorry about it, and wonder what people might think. I believe one of the greatest tools of the enemy is to keep us busy, if he can keep us busy he can keep our minds off of things above and have us focus solely on this world. Sure, some of you may HAVE to work on Sundays, so the only natural response is to find a different day to rest. Whatever that day may be for you set aside one day each week to do as little as possible. Play with your kids, watch an extra show on television, take time to enjoy the moment. Turn off your work email and phone calls. Relax your mind and body and spirit from the things of this world and allow God to energize you!